1. Preheat the oven to 220°C, gas mark 7. Cook the Tuna & Red Pepper Fish Cakes for 25 minutes according to the pack. 2. Meanwhile, coarsely grate the courgettes and carrots. Whisk together the olive oil and white wine vinegar, season and stir into the grated salad. 3. 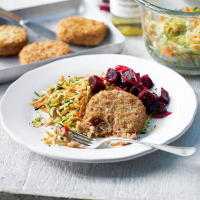 Serve the fish cakes on top of the salad and top with beetroot salad.